Lillooet-based Fort Berens Estate Winery has added a super-premium Meritage blend called Red Gold to its portfolio. The first release is from the 2014 vintage. Production was limited to 109 cases, at $45 a bottle, and 48 magnums with original art on the label, at $399. By the time you read this, Red Gold will be almost certainly be sold out. Production was limited in order to maintain the quality of the winery’s 2014 Meritage, a bread and butter Bordeaux blend with a volume of 1,170 cases. The 2014 vintage was so solid that, even with five “best” barrels set aside for Red Gold, the winery had no difficulty making a first-rate Meritage. In fact, 2014 was a landmark year for Fort Berens for other reasons as well. That vintage was the first made entirely in the new, well-equipped Lillooet winery and by a new and ambitious young winemaker named Danny Hattingh. And it was Danny who urged making a super-premium red when he saw the quality of the 2014 wines. The winery already has a premium Chardonnay called White Gold. It was launched in the 2010 vintage when two barrels of Chardonnay were of exceptional quality. “We had the idea there must also be a Red Gold,” Rolf says, “but we thought the Red Gold would be a Pinot Noir. We have five clones of Pinot Noir. But we were not actively working towards a Red Gold at all until when it came up in the 2014 vintage.” In other words, until Danny proposed the idea. Danny and his partner, viticulturist Megan DeVilliers, came to Canada 10 years ago from South Africa. Danny received his enology degree at the renowned Elsenburg Institute in Capetown. He met Megan at university where she was studying law. She began helping him on his practicums and that triggered her to switch to viticulture and pomology. They first came to Canada as vacationing students to visit Danny’s stepfather, a doctor in Dawson Creek. Attracted to Canada, they returned in late 2007 and checked out wineries across the country. They send résumés to numerous wineries, especially in British Columbia, and were snapped up by Saturna Island Vineyards in the summer of 2008. After turning the winery around, they left in 2010 to travel. Returned in 2012 from their travels, the couple headed for the Okanagan. Megan took a variety of viticultural assignments while Danny became the winemaker for two Summerland wineries, Saxon Winery and Sage Hills Winery. Danny was given a comparatively free hand in the Fort Berens cellar. He began a series of winemaking trials that fall in order to understand the various terroirs from the winery buys grapes. Fort Berens supplements the production of its 20-acre Lillooet vineyard with grapes from Okanagan and Similkameen vineyards. One of his more interesting trials that fall was air-drying some of the estate vineyard’s Cabernet Franc grapes (in a nearby hop-drying shed). After six weeks, evaporation reduced the weight 30% while concentrating sugar, flavour and acidity. The grapes were then barrel fermented (there was just one barrel). This technique of making ripasso-style wine is traditional in the production of Amarone and Valpolicella wines in Italy. Only a few B.C. wineries have made wine with partially air-dried grapes. In 2015 the ripasso-style Cabernet Franc was one of five barrels blended to produce Red Gold. The blend also includes a barrel each of Merlot and Cabernet Franc from the estate vineyard, a barrel of Merlot from Blind Creek vineyard in the Similkameen and a barrel of Cabernet Sauvignon from a grower in Osoyoos, Roger Pires. A significant premium had to be charged for the 48 magnums because of the packaging. The winery commissioned label art from a Lillooet artist named William Matthews, choosing an image of a sunrise over the Fraser River Valley. While the basic design of the labels is similar, the artist added an individual touch to each canvass. Yes, canvass is correct. The over-size labels, numbered and signed by the artist, are painted on canvass and can be removed from the bottles for framing. A week after the Red Gold release, all but 13 of the magnums had been sold. Rolf has yet to decided whether some of the 2015 will also be bottled in magnums. Here are notes on Red Gold and the other recent releases from Fort Berens. Fort Berens Red Gold 2014 ($44.90). The wine begins with generous aromas of cassis and black cherry, which lead to flavours of black cherry, blackberry, figs and olives. The wine is full-bodied but the long ripe tannins give it a silky texture. It is exquisitely elegant. 93. Fort Berens Meritage 2014 ($23.99 for 1.170 cases). The blend is 65% Merlot, 20% Cabernet Franc and 15% Cabernet Sauvignon. It begins with aromas of vanilla, cherry and red currant and has flavours of cherry mingled with hints of chocolate. It is juicy and lush with soft, ripe tannins. 91. Fort Berens Cabernet Franc 2014 ($24.99 for 1,045 cases). The wine is made primarily with estate-grown grapes with a modest amount of Okanagan fruit in the blend. The wine is bright and bramble, with aromas of cherries and blackberries. Those fruits are echoed on the palate, mingled with cola flavours. 88. 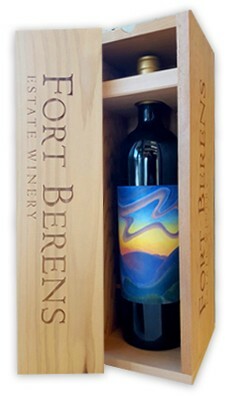 Fort Berens Pinot Noir 2014 ($25.99 for 672 cases). This wine is made with five clones of Pinot Noir, all grown in the winery’s Lillooet vineyard. The aromas are fruity with a hint of spice and forest floor. The palate is lively with flavours of raspberry and cherry. The texture is silky and ethereal. 88.